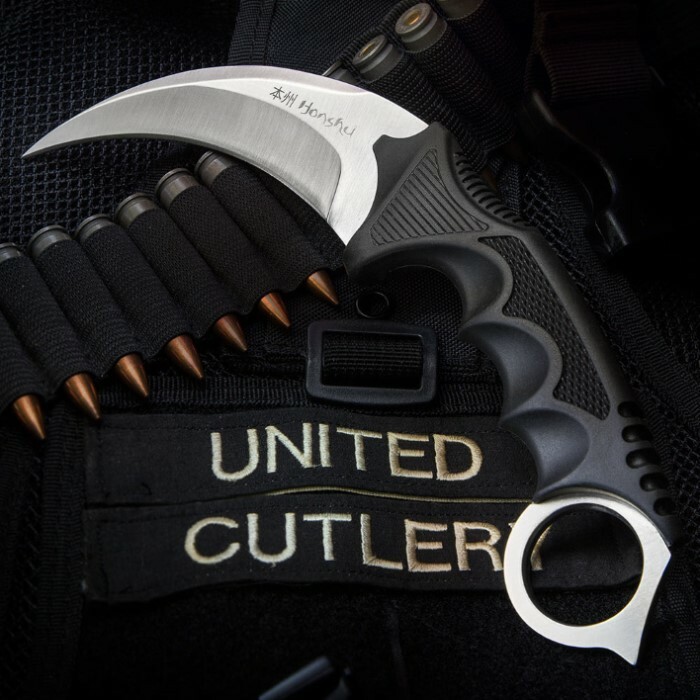 This aggressive karambit features a tactical design, wicked AUS-6 Stainless Steel blade, secure rubberized handle grip, full tang construction and "skull crusher" ring spike. 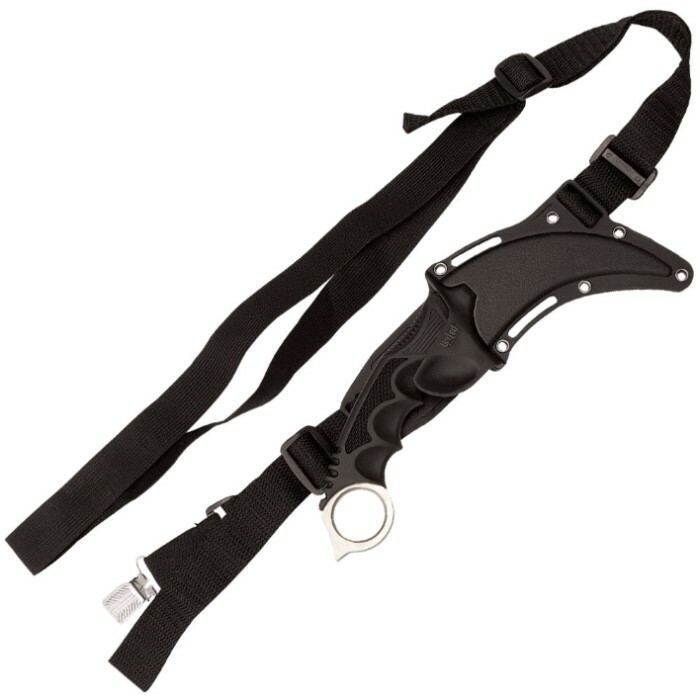 Includes a sheath with shoulder harness, useful for concealed carry. 4 in. blade, 8 3/4 in. overall. 1st of the harness is not the best but you can always buy a quality one. Now the knife itself is insane, the blade has a wicked curve and is extremely sharp! 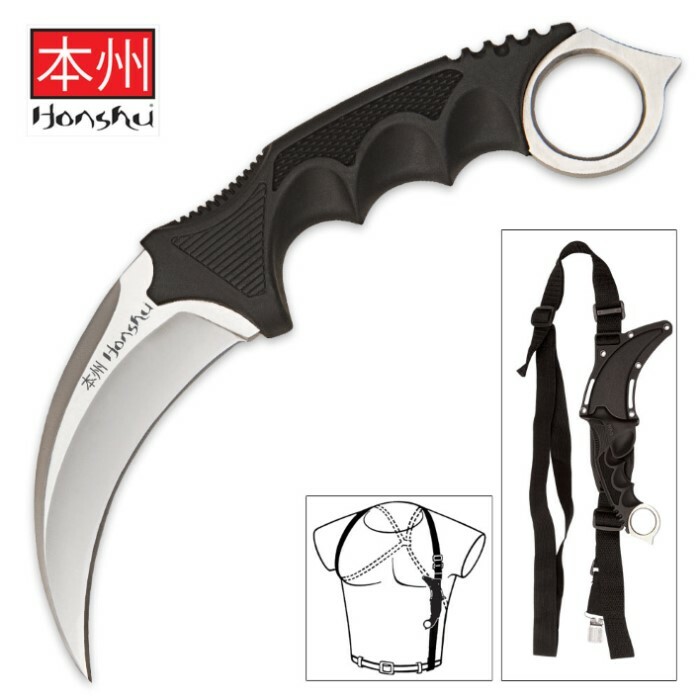 The Karambit is a very nice knive. You can effectively hold it facing almost any direction, though normally it is held downward facing in or out. This one is very sturdy, nice blade and handle, and cuts smoothly. Tip is a bit squared off, not a real issue considering the angle you strike at. The sheath however, is an elaborate piece of junk. Not the one pictured on here or the box. From the belt, over the shoulder, and loop around the arm. No strap coming down the back. My arm loop was put together twisted, so there is always that awkward twist somewhere. Regardless of the straps, the sheath itself is rather bulky. Noticeable immediately. Also a very awkward draw, the sheath faces to the left. So, once you grab the knife you have to twist your wrist uncomfortably while pulling back and away from you. In terms of ease of use and concealment, the sheath is pure garbage. Knife is amazing though.